I had two reviews posted at Unreality SF last week: one of last year's Doctor Who audio trilogy with the seventh Doctor and Mel, and one of Series Four of Survivors. Posting this notice before this review makes me think there should be a Doctor Who comics by Mark Waid and Barry Kitson. They would be good at it. But then, I think they would be good at almost any comic. This is the final volume of Mark Waid and Barry Kitson's run on Legion of Super-Heroes, which means it will be my last post in this short-lived series of posts (though I do plan on eventually picking up what Tony Bedard and Jim Shooter did with this version of the Legion later on). In my review of Teenage Revolution, I set up the idea that a lot of fiction about revolutions deals with idea of "shrugging": how a character justifies the deaths that are needed to bring about utopia. Though Waid and Kitson's Legion of Super-Heroes has largely shied from depicting violence by the Legion against the state, this volume does have a pretty big example of justified violence, albeit in the context of warfare. The last couple volumes have included among their many subplots the simmering threat of the Dominators; in this one, it finally comes to the fore. The Dominators are genetically engineered zealots. Each one believes in the genetic superiority of their species, and things are getting worse, as a Dominator scientist has introduced new genetic code that will propagate through the species, making every Dominator superpowered within a few generations. This means a conventional military defeat is insufficient; the Legion must commit genocide in order to win. 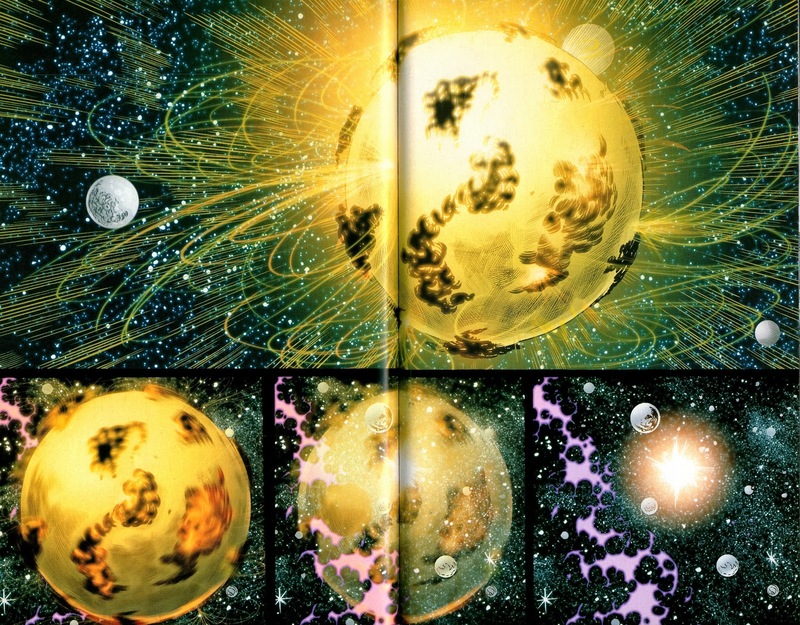 If they just confine the Dominators to their homeworld, within a few generations, the Dominators will be unstoppable. Thus we have Cos assuming a sort of Ozymandias-like posture: this is a burden he must take, only he is capable of doing so. He's the only person advanced enough to sanction mass murder to save universe. Both Mon-El and the Dominators are not actually dead, but shunted into another dimension. 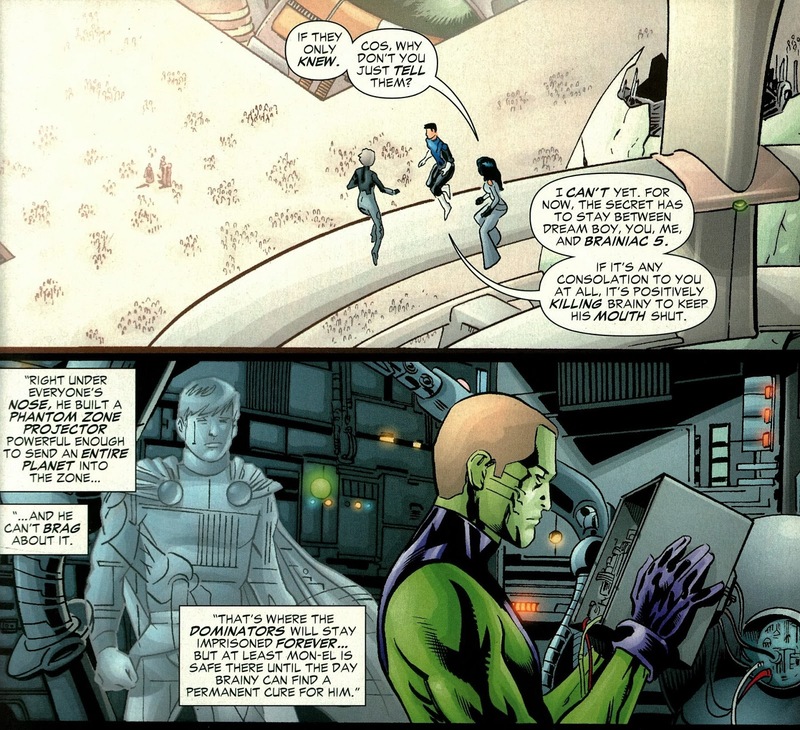 Everyone thinks Cosmic Boy committed genocide, but he actually did not, though the continued existence of the Dominators needs to be kept a secret for various plot reasons. Now I'm not complaining that I don't get to read a comic book about teenagers committing genocide per se, but there are a lot of ethical complexities to revolution, and since this book framed itself as being about one, I wish it had delved into them a little bit more. If it doesn't, it doesn't take sufficient advantage of its unique premise, and becomes just another superhero team comic. But I think that's what DC wanted. In my discussion of Adult Education, I talked about how Waid and Kitson modeled the reading practices they wanted their readers to follow. But it wasn't working, at least so the sales indicated. Soon after Waid and Kitson left the book, they were replaced by Jim Shooter, who had written the Legion back in the 1970s. The metatextual message here seems pretty clear to me: here is the Legion you knew and loved in the past. If DC Comics had been trying to cultivate a new, younger readership with the "threeboot," they had given up and were now chasing after the older die-hards who had read the Legion as children. I haven't read Shooter's run yet, but I understand that under him, the idea of the Legion as a youth movement was diminished, and it became a more traditional superhero team book. I thought we had a home run on our hands. I really did. The reader response to it was really good. In-house, people loved it. At DC. I felt like we were hitting it out of the park. But we were right at that point where the marketplace was deciding whether or not fresh takes on old things or whether it wanted what it read in the 1980s. 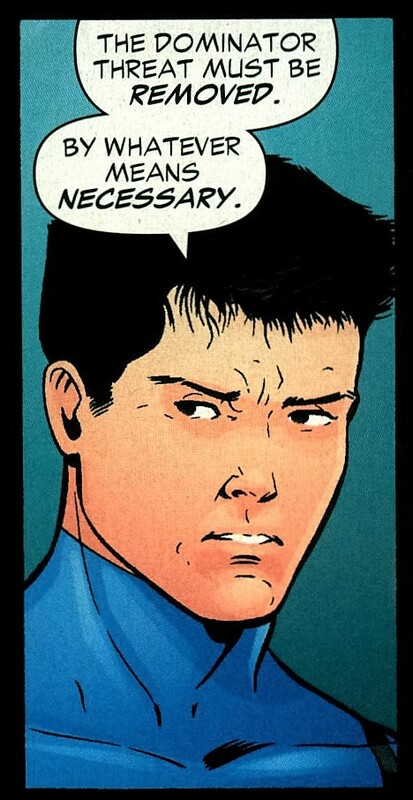 "Why can't comics be good the way they were when Mommy was still alive?" And we lost that bet. It felt to me that we did exactly the right thing, which was, "Look, I’m going to treat this beloved franchise as if it’s been a moribund, dead property for 15 years and we’re dusting it off and give you a whole new spin on it." There was an appetite for it at first, it seemed like, but then it just... people love their Legion comics the way they were in 1985. I can’t fault them, but I thought that would have been over the fence. Either ironically or inevitably, the very nostalgic reading practices they had used the comic to argue against proved its undoing. Not even Jim Shooter could save the "threeboot" Legion, however; in 2009, just two years after Waid and Kitson left, DC cancelled the book, and it was replaced by the "deboot" Legion, which restored the status quo to what it had been in 1986, ignoring everything that had come in the intervening 23 years. Nostalgia had defeated the revolution.